One cool cartridge. Two iconic brands. When purchasing instant film, you have to be careful about compatibility. To make life easier for forward-thinking photographers everywhere, Polaroid teamed up with Fuji to create this PIF300 Instant Film, which works across both brands and their many popular instant print cameras. The value pack helps you save money as you snap with plenty of individual sheets and amazing inkless printing technology. Now, you can take selfies, pose with friends, and document your family's adventures without waiting on the drug store to develop film. Whether you prefer the Polaroid PIC-300, Instax Mini 9 or any Fujifilm model, the paper promises a perfect fit thanks to its universal cartridge. Simply load the unit into the device, capture what you see, and watch a physical photo magically appear with breathtaking color and unbeatable clarity. These high quality prints won't bleed, rip or fade over time. So why keep wondering if it's compatible? Stop worrying, and start printing the story of your life with a pack of PIF300 Instant film! Compatibility with all your favorite mini instant print cameras! Take dazzling photos at home, on the road, and with all your favorite Polaroid and Fujifilm cameras. 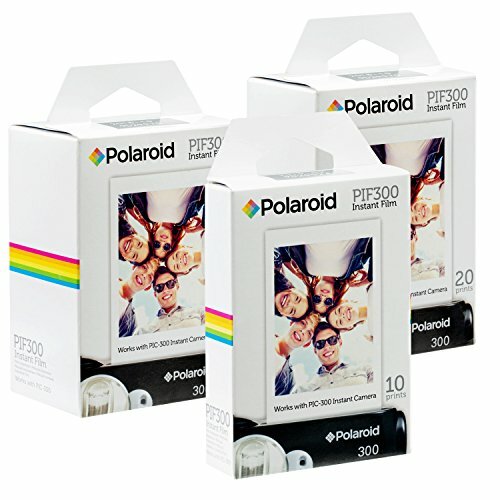 Grab a pack of Polaroid PIF300 Instant Film in the quantity of your choice-and start snapping today! EXCITING, MEMORABLE, OUTSTANDING - This Polaroid Fujifilm INSTAX mini instant films are Hi-Speed ISO 800 quality - With outstanding grain quality, Polaroid Instax Mini Film ensures remarkable, vibrant, brilliant color and natural tones. SOCIAL ON THE GO - Turn your favorite photos into influential significant with the credit card size - 5.4 x 8.6 cm (film size) - The unique credit-card sized Polaroid film fits perfectly in your purse or wallet and has that noteworthy white classic frame that you can personalize with creative messages. INSTANT, SHARABLE, FUN - Capture extraordinary moments and enjoy the picture right away. All you do is, Press the shutter, capture the moment, and watch the photo slide out and the image develop in front of your eyes instantly! Easy-to-Load Cartridge - Film cartridge is designed and labeled for easy loading and filled with film for 10 credit-card sized instant prints, easily load them into your Instax or Polaroid PIC 300 camera. If you have any questions about this product by Polaroid, contact us by completing and submitting the form below. If you are looking for a specif part number, please include it with your message.